"Since ancient times, stories of epic battles and mystical legends have been passed through the generations across the rugged and mysterious Highlands of Scotland. From Disney and Pixar, a new tale joins the lore when the courageous Merida (voice of Kelly Macdonald) confronts tradition and challenges destiny to change her fate. 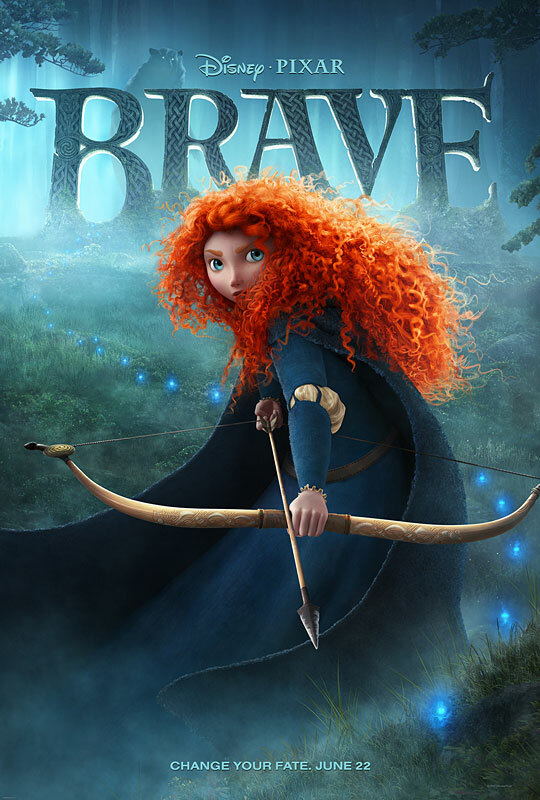 Brave follows the heroic journey of Merida, a skilled archer and headstrong daughter of King Fergus (voice of Billy Connolly) and Queen Elinor (voice of Emma Thompson). Determined to carve her own path in life, Merida defies an age-old custom sacred to the unruly and uproarious lords of the land: surly Lord Macintosh (voice of Craig Ferguson), massive Lord MacGuffin (voice of Kevin McKidd) and cantankerous Lord Dingwall (voice of Robbie Coltrane). Merida's actions inadvertently unleash chaos and fury in the kingdom, and when she turns to an eccentric Witch (voice of Julie Walters) for help, she is granted an ill-fated wish. The ensuing peril forces Merida to harness all of her skills and resources - including her clever and mischievous triplet brothers - to undo a beastly curse before it's too late, discovering the meaning of true bravery." Also released with the new trailer for Brave was an equally beautiful looking poster too, which you can see in all its glory at the top of this article (click for full-size). Brave will be released in cinemas across the UK on 13th August 2012 . Did that trailer get you excited for Pixar's next film? Do you think it will be a blockbuster or lacklustre? Leave your comments below!